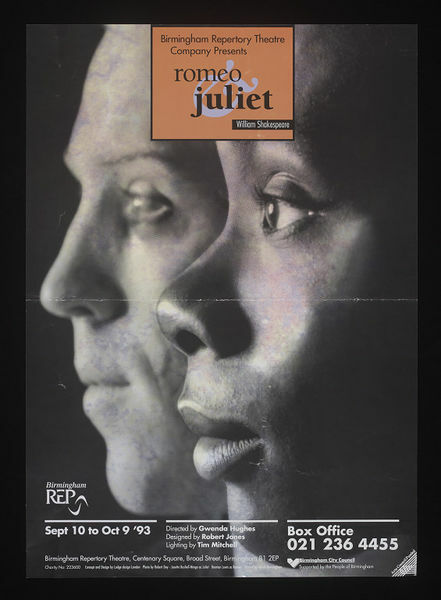 Poster advertising Romeo and Juliet at Repertory Theatre, Birmingham, 1993. 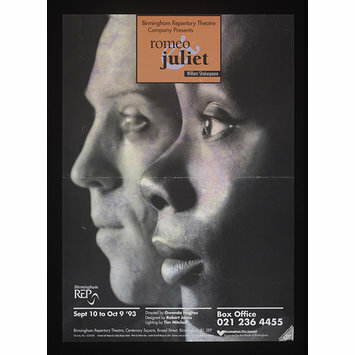 Photographic and typographic poster advertising Romeo and Juliet at Repertory Theatre, Birmingham, 1993. Associated Production: Romeo and Juliet. Playwright: William Shakespeare. Director: Gwenda Hughes. Designer: Robert Jones. Actors: Josette Bushell-Mingo, Damian Lewis. Birmingham Repertory Theatre Company. Repertory Theatre, Birmingham. 10.9.1993. Performance category: drama.